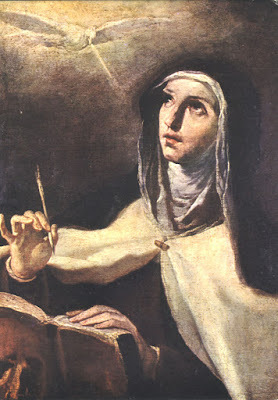 Among the women of Christendom, the bold Teresa of Avila has succeeded in transmitting a profound and enduring record of the nature of spiritual reality and of Christocentric mystical consciousness. 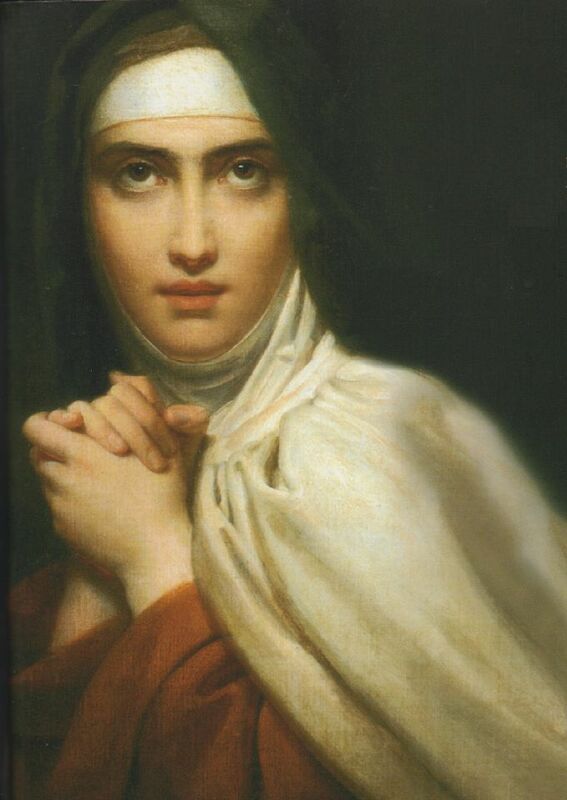 Her biography The Life of Saint Teresa was written in the middle 1500s at the behest of her spiritual directors. In it, she writes with great openness of both her human weaknesses and her extraordinary spiritual attainments. Teresa speaks of the indiscretions of her youth, of her own “depravity”, of her vanity, and of other sins and failings. Interestingly, Padre Pio of Pietrelcina spoke equally scathingly of his own “sinfulness”. One can only wonder where that puts the rest of us. Teresa was able to draw both solace and inspiration from St. Augustine’s “Confessions” at a critical time in her early life. She was thereby strengthened in her resolve to pursue the way of perfection. By virtue of having overcome her own weaknesses, Teresa emerges as one with profound compassion for and understanding of the faults and failings of others. Her prayers carried great power, and many lives were turned around and restored through her intercessory prayer. This notion of expiatory suffering, of taking on the sins and failings of others in order that they may be released of their addictions and afflictions is a recurrent element in the lives of many saints - particularly those who consciously assume the role of “victim souls” as part of their mission. Yet despite her great joy, her early years in the convent were to be characterised by immense affliction and near-insuperable difficulties. She came to know physical suffering intimately, suffering fainting episodes, intense chest pain, and periods of complete loss of consciousness soon after entering the cloister. Her symptoms became so severe that her father arranged that she be moved to a nearby town in order to undergo medical treatment. It proved to be largely ineffective, so much so that a grave-site was prepared at her convent as she received the sacrament of Extreme Unction. Despite the extremity of her symptoms, she recovered and went on to live through many and frequent such experiences of affliction for the rest of her days. This pattern was not unique to Teresa of Avila, but was similarly repeated in the lives of such saints as Padre Pio of Pietrelcina, Faustina Kowalska, Alexandrina da Costa and Josefa Menendez. The lives of these individuals, like that of Teresa herself, were characterised by states of physical and mental distress that would today send most people running to the Emergency Departments of the local hospital. The transparency of her discourses is at times unnerving. She writes with great openness about the difficulties and torments that often accompanied her life of prayer and activity. Teresa has much to say about the nature of the advice offered by spiritual directors. She did not work in isolation, but regularly sought out those who she believed would be helpful in her own spiritual development. She seems to have been particularly attentive to the counsels of her Jesuit mentors. Although Teresa praised the qualities of learnedness and knowledge in those who would act as spiritual guides, she placed a much higher value on the attributes of prudence and experience in directors. She did, however, emphasise that the “man of learning” is often more useful to those who have travelled some way along the spiritual path than to those who are taking their first steps. The Life of Saint Teresa offers us privileged entry into the life world of a woman whose experiences far transcended those described by such writers as Richard Bucke, William James, and Abraham Maslow. Teresa offers a reflective chronicle of the extraordinary graces that regularly infused her life. She urges her readers to remain vigilant, fearless and receptive when faced with the powerful and transformative experiences that can occur during the practice of interior prayer. Teresa offers the perspective of one who has experienced directly such phenomena as physical levitation, “locutions”, direct encounters with Jesus, and mystical vision. She viewed these as uncalled-for and unmerited graces, but understood them also to be helpful manifestations whereby her own community was enabled to think less harshly of her seemingly difficult and contradictory nature. Teresa breathes humility and egolessness in her descriptions of the workings of pure grace. Teresa was a woman of extremes, as capable of experiencing the rapturous states of physical levitation and luminous vision as of enduring extreme physical pain and mental anguish. She was also a woman of unstoppable drivenness who gently but decisively neutralised the opposition of many - even within her own order - who were hostile to her ideas. Her reforms brought great spiritual renewal to the Carmelite order. In her remarkable autobiography, Teresa reveals the full extent of her personality. She also provides the reader with a vivid account of the extraordinary reality she inhabited for most of her life. In the video clip below, Anglican Archbishop Rowan Williams very graciously shares his deep knowledge of the life and times of St. Teresa of Avila. His audience is drawn from the students and teachers of the Jesuit-run Boston College in an event co-sponsored by the Institute for Carmelite Studies to celebrate the 500th anniversary of Mother Teresa's birth. In using the term "outsider", Williams is perhaps alluding to his non-Catholic position, though it becomes obvious very quickly that he is no outsider in regard to his relationship with - and understanding of - St. Teresa and her unique charism. Williams gives much attention to the subtle skill with which Teresa navigated her way through the fierce constraints of Inquisitorial Spain during the middle to late 1500s. Her sharpness and tenacity ensured that she and the women in her care were able to live their contemplative calling with relatively little interference from the usually-interfering male-dominated clergy of the time. The Question and Answer session towards the end of the presentation reveals the great gentleness, the great sensitivity of engagement, and the generous presence of this man of uncommon wisdom. In particular, his own reflections on the nature of prayer reveal the depth of his immersion in - and the depth of his struggle with - the process. The forces that govern secular modernity have long sought to strip the world of its numinous essences. The miraculous has been relegated to the domain of superstitious folly while religion has been deemed an archaic and outmoded institution suitable only for the weak and feeble-minded. Christianity has, for many, become a faded repository of fundamentalisms that serve only to obstruct and impede the progression of "enlightened" liberal thought. Many of the rituals and practices that continue to serve those who remain within the fold of Christianity are seen as merely symbolic at best and deluded at worst. This post was prompted by a close viewing of the 2017 Thomas Lecture presented by Irish philosopher William Desmond at the Saint Meinrad Seminary and School of Theology in southern Indiana on April 6th 2017. The lecture was entitled "The Idiocy of Being in Aquinas' Third Way." Although the presentation nominally served to address St. Thomas Aquinas' third argument for the existence of God, the greater part offered a privileged entry into Desmond's thought, particularly in regard to how the contemporary Western mindset has come to one of default atheism. Desmond offers a highly individuated perspective on the intellectual currents and armoured modes of being that have contributed to this development. The audio below offers an edited and slightly abridged version of the lecture.